Powder Works serves a wide range of customers, including small and large metal fabricators to Fortune 500 OEM’s. The types of parts we coat, the colors/powders we spray, and the industries we serve is only limited to the size of part our system can handle. What is the largest size part you can coat? Our system can handle a maximum part size of 3 feet wide x 5 feet tall x 10 feet long, which covers the vast majority of metal parts produced. We maintain a large array of hang tooling from specially designed hooks and racks to efficiently coat a vast range of part geometry. Our lead-time is driven by the customer’s needs. We like to have 3 to 5 five working days to optimally schedule the plant, however consistently responding to expedited requests is second nature to us. We understand that coating is typically the last step prior to you having a completed part that is ready to ship and invoice. Do you offer pick-up and delivery service? 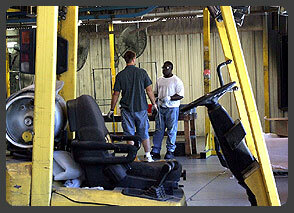 Powder Works has arrangements with several freight services that will pick-up and deliver your parts. The frequency of trips is dependent on your lead-time goals and proximity to our coating plant. 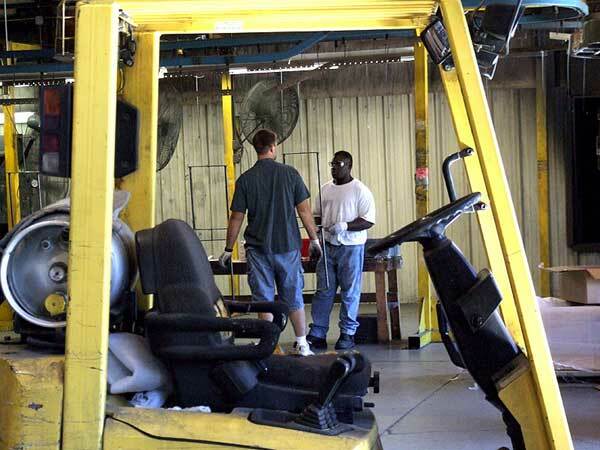 Our facility is equipped with extra dock doors for trailer storage and we also welcome you to handle your own delivery and pick-up.